We propose using community-centered analyses and agent-based models of scientific gatherings such as conferences, symposia and workshops as a way to understand how scientific practices evolve and transition between local, community, and systems levels in science. We suggest using robotics as a case study of global, cross-cultural, interdisciplinary scientific practice. What is needed is a set of modeling frameworks for simulating both the internal and population dynamics of scientific gatherings. In this paper we make the case for conference models as a mid-level unit of analysis that can advance the ways scientists and citizens design systems for transferring and producing knowledge. A continuing challenge in the study of science is bridging micro-level analyses that provide a rich interpretive understanding of local interactions among scientists and the material artifacts used in research with macro-level analyses of large data sets that give a systemic view of the large-scale structures and dynamics of knowledge production. These micro- and macro-level perspectives correspond to two distinct research traditions within the study of science. One is the study of science as culture or scientific practice. Researchers in this area analyze local, contextualized interactions among scientists, institutions, and technologies using interpretive methods such as ethnography and history. The other area uses information theoretic tools to analyze documents and other textual artifacts to map science communication and understand how population-level structures in science develop over time and differ from community to community. In order to bridge these two approaches, we propose using mid-level analysis that combines the cultural and information theoretic understanding of science to help scientists reinvent and improve the places and technologies for communicating and creating knowledge. This is becoming increasingly important as governments and citizens face new ecological and societal problems that require diverse teams of researchers working in concert with the citizens and industry to create solutions. A social simulation community that focuses on the design of communications technologies, organizations, and events should play a key role in producing these mid-level studies. We propose using community-centered analyses of scientific knowledge and agent-based models of scientific communities to translate between local-level, situated understandings of knowledge production and systems-level, statistical understandings of large scale processes and patterns in science. We focus on academic gatherings such as conferences, symposia, and workshops as a mid-level unit of analysis that is of strategic importance not only to our search for a meso-scale bridge between existing approaches, but to the development and continued practice of science as information, techniques, tools, and people are exchanged among various local communities of practice. An emphasis on scientific gatherings brings into focus both the variety and depth of human experience through participation in scientific communities and the systems-level patterns derived from publication information, citation networks, attendance records, organizational data, and other sources that comprise a wider understanding of the structure of a field or discipline in science. Such gatherings are formal structures of the right size that can be a basis for a range of simulation model projects of varying scale and scope, such as those that look at internal dynamics of a single conference as well as the developmental patterns of many interconnected conferences recurring throughout the history of a field or discipline. In section one, we will discuss two existing approaches—scientometrics and lab studies—as examples of the systems-level and locally situated perspectives in the study of science. We then propose studying scientific meetings (e.g. conferences, symposia) as a mid-level unit of analysis, using agent-based modeling as a methodology that can help us understand transitions between local, community, and systems levels in science. We continue by delineating a modeling-based approach for studying conferences and suggest robotics as a fruitful field to use for a case study of global, cross-cultural, interdisciplinary scientific practice. Scientometrics, or the quantitative study of science and scholarly communication, arose from attempts to make study of science more scientific. The foundations of the approach were set when Price published his highly influential book Little Science, Big Science in 1963 and, in 1955, Garfield published an article "Citation Indexes in Science" proposing this new tool, Citation Index, the regular publication of which started in 1964 through the Institute for Scientific Information. Scientometric approaches use formal literature (e.g., articles, grants, patents) of science and scholarship as their main data source. Given that documents represent the fundamental artifacts of scientific work, it is assumed that these artifacts are related to the nature and growth of scientific fields or disciplines. Journal articles, because of their exceptional communication and archival function in modern science, have been most often used for studying science, with the assumption that their role as a repository of research results makes them an excellent data source. Documents can be clustered, classified or grouped according to their shared characteristics (authors, author affiliation, title words, keywords, abstracts, references, journal in which they were published) and maps of these clusters can be constructed by measuring the degree of similarity, relatedness, or proximity between pairs of clusters. While this approach is very good at mapping structures and describing their changes over time, it is less adequate at understanding the processes leading to specific social and cognitive structures. In contrast to the system-level view of scientometrics, 1979's Laboratory Life by Steve Woolgar and Bruno Latour brought attention to science as it is conducted through daily interactions among scientists, between scientists and the materialities in the lab, as well as the practices of translation and inscription that lead to the production of what we count as "knowledge"—a published paper. Woolgar and Latour's work is an early and influential example of the larger field of "lab studies," also framed as the "cultural approach" to the study of science, in which scholars of science directly observe the practices and discourses involved in the local production of knowledge, "in modern science typically the scientific laboratory," (Knorr-Cetina 1995, p. 140). Laboratory studies mark a move in science studies from the study of science as knowledge towards the consideration of "science as practice"--what scientists do, along with the context and product of their work (Pickering 1992, p.2). Systems of socially distributed cognition, such as the research laboratory (Giere 2004) allow the researcher to "step inside the cognitive system" and observe its internal organization and operation (Hutchins 1995, p.129). The culture and social organization, as well as capabilities of people and artifacts, determine how a cognitive system works (Giere 2002, p.641). Studying this kind of system, therefore, opens up an unprecedented view of the internal workings of science as the product of dynamic, daily interactions between people, artifacts, concepts, and the built environment. While the methods and units of analysis of scientometrics and lab studies are quite different, they are both connected through their focus on understanding what makes up what we call science and knowledge. Mostly focusing on dissemination of knowledge and ideas through publications, scientometrics looks at what happens to the products of daily work in the lab after they have been sanctioned by the broader scientific community, while lab studies look at the work and materials that go into making a publishable piece. Both of these approaches, however, miss the interaction and shaping of ideas and practices that occur in the space between local interactions in the lab and global exchange through scientific journals. One important venue that mediates the local and global are scientific gatherings—conferences, workshops, and other meetings at which scientific research is stabilized, standardized and universalized through interaction and communication among people from a variety of labs and institutions. These community-wide meetings bring together people for social and scientific exchange and provide a space in which concepts, tools, and techniques are discussed, vetted, and adopted across local groups. While conferences present a mid-level unit of analysis that bridges the local context of the lab and the global system of publication, an area in the science of science with high potential for creating the theoretical foundations for developing agent models that translate between macro and micro models of science is philosophy of biology that stems from studies of evolutionary developmental biology. An evolutionary perspective on science focuses on understanding the relationship between cognitive and cultural development (Wimsatt and Griesemer 2007). Here development recurs across multiple levels of organization and the challenge is understanding the ways in which each one is generative of the others. Individuals, for example, take part in creating social practices and, in doing so, develop understandings of the practice that are both "in the mind" and embodied "in the world." A higher level of organization, such as a company or an academic society, develops the spaces in which these practices are performed, which are realized through shared memories of members, the repeated practices of groups, and through the accumulation of objects and materials that support the repetition of critical self-sustaining and self-transforming activities by the organization. Individuals associate experience with the organization and make it part of their social identity. One potentially useful model from the philosophy of biology is David Hull's demic structure of science (Hull 1988), where science is construed as a hierarchical arrangement of overlapping social groups of different scales: the individual, the research team, the deme, and the invisible college. There are several functional effects that this structure has on the development of science. A deme within science is a social group that scaffolds the development of new scientists and minimizes risk taking by providing ideas and resources already recognized in the wider community. Scientists within the same deme coordinate (compete and cooperate) more directly among themselves than with scientists across demes. Demes also form competing relationships with other demes. In such relationships demes scrutinize the ideas associated with competing demes and, because entire groups are synchronizing with an opposing idea, the tempo and direction of scientific change can occur quickly and dramatically through such inter-demic relationships (Hull 1988, Grantham 2000). Hull noted that individual researchers participate in and create groups and conduct research at high personal cost in order to gain credit. The core configuration model proposed by Caporael (1997) couples different modes of individual cognitive development with the demic structure (see Table 1). What we see here is that most of the "action" (e.g. social construction of reality, stabilizing language) occurs in demic and macrodeme settings, which assemble within larger gatherings. Table 1: The core configurations model. Adapted from Caporael (1997). Although we do not specify particular generative mechanisms in this paper, these insights from the cultural and developmental perspectives offer us some requirements for locating a modeling target that can integrate micro and macro approaches to the study of science. Cultural evolution models point us toward the importance of embodied experience in material settings that is formative of individual cognitive and social development. One such setting is a scientific gathering, or conference. Conferences are also an ideal target because they have a similar social and material structure across the sciences, while other locations of scientific practice, such as laboratories, might differ widely in terms of material context. One of the potential benefits of agent-based modeling is its ability to allow the user to incorporate understandings of local-level decisions, such as the choice to reject or accept a conference paper, in investigating the global patterns that result from an ensemble of decision types being executed in parallel by multiple agents. Agent models of science have taken up many different questions about science. Gilbert (1997) developed a model of journal authorship patterns to show how simple locally executed rules can produce well studied authorship patterns showing the distribution of repeat authors in scientific journals. A more sophisticated model introduced by Borner (2004) uses simple agent rules to generate both co-authorship and citation network patterns that match 20 years of data. Two recent uses of ABMs in science show how models can address policy concerns. Understanding how opinions form in science could guide decisions by funding agencies to promote an environment where one theory or view could quickly take over or to promote environments where opposing and multiple theories are more desirable (Sobkowicz 2011). A second policy example looks at the broader economic context of innovation, linking industry and science, to show how structural limitations, such as access to capital which can be affected by government or large industrial groups, can be offset with strategic collaborations (Ahrweiler, Gilbert & Pyka 2011). To our knowledge few, if any, high-fidelity agent-based models of scientific communities exist that meet the criteria specified by Kuznar (2004). These are "models of detailed and complicated phenomena focused on capturing the social dynamics of a particular social setting." Such models should incorporate geographic data as well as physical movement within local environments such as in the lab, on college campuses, or in conference settings. Establishing a social simulation practice of science that incorporates a range of modeling approaches—from theoretical to high-fidelity, policy-specific models—to understand scientific practice would be well suited to using conferences and similar gatherings as a foundational unit. Although scientific gatherings have been an integral part of modern science since its inception (e.g., the meetings of the Royal Society), and still are central to the practice of science, they have been relatively neglected as an object of inquiry (Reychav and Te'eni 2009, Jeong, Lee and Kim 2009, Godin 1998, Soderqvist and Silverstein 1994). Nevertheless, they are very interesting for a number of reasons. Academic gatherings offer structure as well as a rich environment where the local action of science plays out. They are unique places to trace: (a) the exchange of knowledge, ideas, new theories; (b) the consensus building on what interesting research topics are; (c) informal interactions and networking among researchers; (d) the process of initiation and socialization into a research community; (e) the distribution of scientific statues and role; and (f) reward systems in science. Understanding the roles different academic gatherings play in a particular research arena over time can add a big missing piece to the puzzle of how scientific fields form, organize, and develop. By looking closely at academic gatherings, we can get a better understanding of communities of thought and how new ideas get accepted and propagated as well as how new researchers get brought into those communities. In addition, for current conferences, one can use ethnographic observations and interviews to gather data on informal gatherings and interactions, question and answer parts of the sessions, and points of controversy and discussion during the meetings. All of these data can be used to create a typology of networks and types of behaviors and exchanges characteristic of each. As typologies for conferences are sorted out, modelers can begin working on creating multiple models of conferencing. The goal here would be to investigate the kinds of questions we can ask given different sorts of typologies and different propositions about how both the internal characteristics of conferences and the networks of conferences evolve. Models can and should range from high resolution spatial models—such as one with individuals moving through the hallways, selecting talks to attend, finding and sitting in meeting rooms, and so on—to those that model networks of conferences and the characteristics of a large population of scientists moving through the conference circuit over a period of many years. Figure 1. Group size and lifespan of organizational forms in science. Conferences and meetings are tractable units as they have short, determined lifespans and a broad range of sizes. Our discussion above describes conferences as venues in which social, cognitive, and institutional practices of science are performed and which provide a mid-level of study and analysis that bridges local-level qualitative analyses and systems-level quantitative analyses of scientific practice. We propose applying our modeling framework to study the development of robotics as a field of technoscientific research and development. At first a topic of fiction in the works of Czapek and Asimov, robotics became a reality with the implementation of the first industrial Unimate robot in the 1961. In only 50 years, it has become a major player not only in the public imagination through movies such as Terminator, A.I., iRobot and Wall-e, but in economic policy in Japan, Korea and the US, military research and development, and in STEM education. The 21st century has been referred to as "the Age of Robots," and it is expected that robots will be the next technological revolution on par with computers and the internet (Gates 2007). With its relatively speedy acceptance and current importance, robotics is a compelling case study for the development of new fields of scientific inquiry. Robotics is also a good example of a problem-based science; it has been multidisciplinary from its inception in the 1960s, as the development of machines that can sense, think, and interact physically with the world requires expertise in electrical and mechanical engineering, computer science, and other fields. More recently, as applications of robots have been moving outside of the industrial lab and into more naturalistic environments, new fields such as social robotics, educational robotics, and human-robot interaction have extended robotics to involve scholars from cognitive science, psychology, anthropology, philosophy, education, as well as relevant domain experts. While in the early days of robotics scholars communicated primarily through research reports, currently the robotics community gathers to exchange information, members, and standardize practices at a number of conferences, workshops, and symposia. This includes large conferences such as IROS (IEEE/RSJ International Conference on Intelligent Robots and Systems), ICRA (IEEE International Conference on Robotics and Automation), AAAI, and RSS(Robotics: Science and Systems), and smaller domain-specific conferences such as Humanoids (IEEE-RAS International Conference on Humanoid Robot), HRI (ACM/IEEE International Conference on Human-Robot Interaction), RO-MAN (IEEE International Symposium on Robot and Human Interactive Communication), and AAAI symposia, among others. While it is global, the robotics community is also relatively well-defined through its focus on the development and study of robots. Participation in robotics has so far been limited by access to robots themselves; initially an expensive and elusive technology, robots are currently becoming more affordable (e.g. Nao, Bioloid) and we can therefore expect interest and participation in robotics to increase within and beyond the scientific community. In studying robotics, we plan on using network-based analyses of robotics (based on data relating to publication and citation, attendance in robotics conferences, and organization of said conferences, as well as membership on conference committees), situated inquiry involving participant observation in conferences, as well as surveys and interviews with roboticists to develop models of conference dynamics as well as models that describe how individual actors move within and tie together the field. We will focus on social, cognitive, and institutional developments in robotics, looking at how people interact within the conference, how ideas are transmitted within conferences and then the field as a whole, and the role that groups from different institutions play in the continuing development of the field. This will allow us to develop a deeper understanding of the way ideas that get developed in daily scientific practice among small groups fit into the broader robotics community, how knowledge production is scaffolded through informal avenues of communication, and how different ideas are received and disseminated. In this paper, we propose conferences as a strategic unit and agent-based-modeling as an appropriate method to study the evolution of scientific communities and of culture at large and delineate a case study of the development of robotics in the last 50 years. 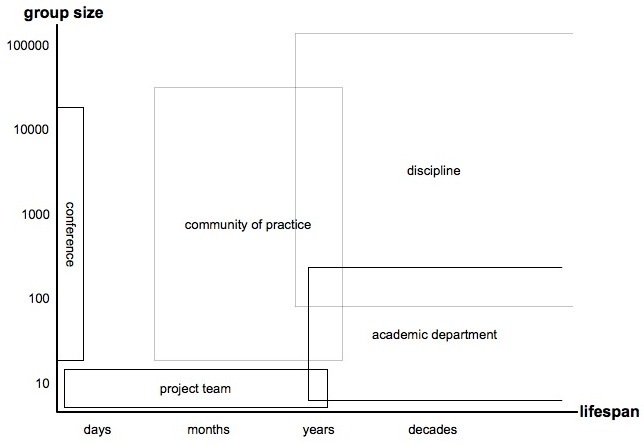 Forming a small demic group of modelers and science analysts that build, share, and evaluate models of conferences and other forms of gatherings could offer a needed resource for integrating embodied, local understandings of scientific practice with network and macro approaches to studying and evaluating science. Such models could help us develop a better understanding of the social factors that play into how science as a locally situated practice produces the systemic patterns of collaboration, interdisciplinarity, changes in conceptual focus, and other broad trends. This, in turn, can help us to design new ways of doing science that involves different social structures, develop the spaces where scientists come together and create knowledge as a community, and create new avenues for communicating science to the public. HUTCHINS, E. (1995). Cognition in the Wild. MIT Press, Cambridge. KNORR-CETINA, K. (1995). Laboratory studies: The cultural approach to the study of science. In Handbook of Science & Technology Studies, ed. S. Jasanoff, D.E. Markle, J.C. Peterson, and T.J. Pinch. London: Sage. pp. 140-166. LATOUR, B., Woolgar, S. (1979). Laboratory life: The construction of scientific facts. Princeton University Press, Princeton. WIMSATT, W. C. and Griesemer, J. R. (2007). Reproducing entrenchments to scaffold culture: The central role of development in cultural evolution. In R. Sansom and R. Brandon (eds), Integrating evolution and development: From theory to practice. M.I.T. Press, chapter 7, pp. 227- 323.